Amazon has made some big changes to the Product Advertising API on which this book, and the code samples contained therein, are based. The changes are outlined here: February 21st, 2012 Changes. They’ve deprecated (e.g. removed) support for a number of operations, stopped returning a lot of product details, and greatly limited the number of products returned by requests. I’m sure there are good technical reasons for these changes, but, as far as this book and the codes samples are concerned, there will be no more updates after this one. I’ve updated the samples to work with the latest WSDL, dated 8-1-2011, and indicated which samples no longer work. Judging from reader feedback over the past years, this book has helped a lot of people navigate the original Amazon Web Services API (that API was later re-named “Amazon E-Commerce Service” and is now called the “Product Advertising API“). A fair amount of the content in this book is now outdated and Amazon has significantly improved their documentation in the intervening years. It’s time to make this book “out of print”. Cheers everyone. 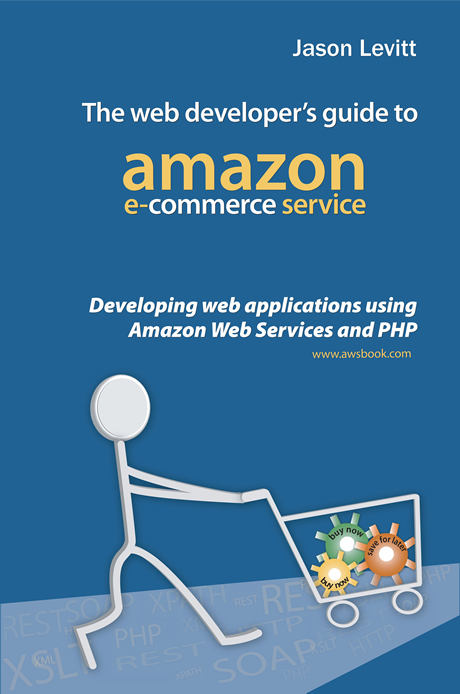 This book is primarily about using PHP to create web applications using Amazon E-Commerce Service 4.0. The target audience is intermediate developers who are creating web applications. That might include people making simple sidebar applications for web sites all the way up to more serious storefronts and even backend inventory systems. Basic understanding of XML and PHP is required, though developers should easily be able to translate the concepts and code samples to other programming languages. Some Scripts From The Book….